Panasonic launches waterproof Eluga smartphone | What Hi-Fi? Panasonic has confirmed its entry in to the smartphone market in the UK with the launch of the Eluga handset. 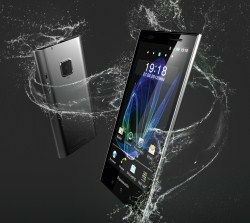 Unveiled at today's European Convention in Hamburg, it's an Android smartphone with a 4.3in screen, slender frame and the added bonus of being waterproof. The Eluga name stems from "elegant user-orientated gateway", and it certainly cuts a trim profile at just 7.8mm wide and weighing in at 103g. The 4.3 OLED capacitive screen has a 960x540 resolution, 1GHz dual-core processor, Bluetooth, 8GB memory and 8MP camera. As well as the waterproof and dustproof claims, it also has NFC built-in, so is "ready for 'no touch' interactions, including contactless payments". Our first look today was at a smartphone sporting Android 2.3.5 (Gingerbread) though an update to Android 4.0 is already slated for summer 2012. It comes with the Viera Remote app, which allows you to swipe pictures and video to a Smart Viera TV or mirror on your smartphone what's on the TV. This app will be available for all Android phones and for iOS devices. No word on a confirmed release date as yet.